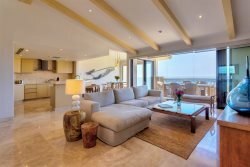 Casa Juan Miguel is a beautiful ocean view villa, featuring 4,100 square feet of impeccably designed Spanish and Mexican architecture, located in the exclusive gated community of Cabo del Sol. This villa boasts great ocean and golf views of the Jack Nicklaus signature golf course. This 4 bedroom and 5 bath home offers ocean views from the master, living, dining and kitchen area. You will find marble and granite finishes throughout this newly built villa. This villa is great for families, a shallow area for smaller children & pool side palapa for entertaining!. You will enjoy the outdoor living areas that include a wet bar covered by a palapa, table for 8, gas grill and a large terrace for lounging under the sun. If you need an additional home or two or three or four, we also have Agave Azul, Casa Stamm, Casa Corona & Casa Tortuga, making it a perfect location for a family reunion, corporate getaway or wedding celebration. You have access to the Sheraton Hacienda del Mar resort amenities (during peak holidays, this may not be possible due to high occupancy) which is a 10 min walk from the home, along the main road. Here you can enjoy access to pools, restaurants and amenities. The beach infront of the resort is great for sunbathinig, skim boarding, surf fishing & sea shell hunting!. I want to thank you for an outstanding stay. The entire TEAM, especially Ricardo and Brenda, were terrific. Your organization is first class and easy to understand why you have been successful in taking care of people in Los Cabos. We will certainly use you again and tell our friends and colleagues. Mucho Gracias from all of us for such a wonderful week. Beautiful!!! Loved every minute of our stay at Casa Juan Miguel! In fact it was so beautiful there we hardly left, there were no activities as appealing as lounging by the pool and hot tub while loving the view of the ocean. We enjoyed walking down to the beach and even saw a whale just off shore on one of our beach walks. It was a fabulous place to come home to when we ventured out for our glass bottom boat tour, parasailing, snorkeling and ziplining! Don't know when I've loved a vacation location more than Casa Juan Miguel! I could not imagine this trip being any better. The location was perfect for us. Rafael, Hector, and Carmen made sure that all of the activities were properly planned, all of our needs were met, and everything went smoothly. The villa was fantastic. The pictures do not do it justice. I would highly recommend Lifestyle Villas and this villa in particular to anyone desiring to stay in the Cabo del Sol area.